High-Income Residents: Are They the Driving Force Behind DC’s Premium Apartments? In a recent post, we concluded that the premium apartment rental market is the more popular and ascendant segment of the city’s housing market in the context of the current trend in net population growth. To further elaborate on this topic, we profile the tenants in the city’s Class A and Class B apartment buildings built after 2000 based on income tax data characteristics. The full research paper can be found here. Table 1 tells us that in 2015 half of the residents who were income tax filers in the 88 Class A and Class B large and mid-sized apartment buildings that were built after 2000 had annual reported income of less than $57,428 and were under the age of 31.5. And, the vast majority of these tenants were single tax filers (unmarried and no dependents) and were relatively new to the city. We classify a new resident as someone who existed in the city’s income tax data in either 2013, 2014, and/or 2015, but did not exist in 2012 or prior. 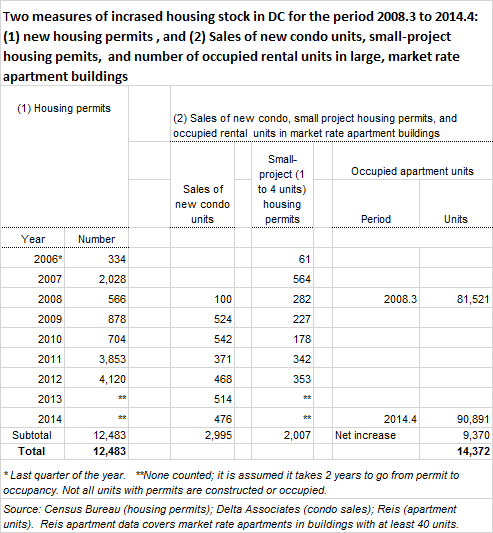 Who is more likely to live in new apartment units? Our data shows that there was a tripling in the number of premium apartment units delivered in 2013 compared to 2012. To better evaluate the data, we divided the buildings into two groups. The first cohort is comprised of all 2015 tax filers found to be residents in multifamily buildings that delivered between January 2000 and December 2012 (relatively older premium multifamily buildings). The second cohort is comprised of all 2015 tax filers found to be residents in multifamily buildings that delivered between January 2013 and December 2015 (newer premium multifamily buildings). We then fit a statistical model to the data to determine the characteristics of new buildings versus older buildings. Using T-tests, we find that the newer buildings tended to have units that were an average of 88.3 square feet (10.5 percent) smaller and cost 17.5 percent more per square foot (Table 2). We also found that individual tenants in newer buildings tended to have income that was on average of $9,884 (12.3 percent) less and 1.3 years younger than renters in older buildings. Using a statistical model to differentiate the characteristics of tax filers living in a newer building in 2015 versus older buildings, we calculate the probability that certain factors affect the choice of residing in newer apartment buildings instead of older buildings. While the tenants in new and older apartment buildings are generally very similar, we were able to again tease apart a few distinctions in the two populations as well as a few contributing factors for their housing choices. We find that income has almost no influence on whether a resident chooses to live in a newer or older apartment building (for every $100,000 increase in income, the probability to choose a newer building increases only about 4 percent). Age is also an important factor in determining how likely a resident will choose newer or older apartment units. Younger residents are more likely to reside in newer apartment buildings. For each additional year in age, existing residents are 0.8 percent less likely to reside in newer buildings, while this percentage is 0.2 percent for new residents. We also find that tenants commonly supplement their traditional wage/salary income with additional business income from entrepreneurial or other self-employment endeavors. Given that 83 percent of all tenants in these buildings are single filers (as shown in Table 1), we find that long time city residents who are head of household tax filers (unmarried income earning adults with dependent children) are 23 percent more likely to live in newer buildings compared to married residents. This is possibly due to the city’s affordable housing efforts to place low-income households in these new buildings via affordable housing programs. And finally, single residents are more likely to reside in newer buildings compared to married filers, especially when they are relatively long-time residents. On government tax forms, adjusted gross income is comprised of wages and salaries, business income, investment gains or losses and other income. In sum, we find the following results. First, 64 percent of the tenants in all the apartment buildings in this study tended to be new to the city. Second, the newest apartment units are smaller and more expensive, and their residents tended to be slightly younger and have less income than residents in the relatively older buildings. Third, residents in the newest units are more likely to have business income as part of their total reported income, which suggests there is an increased tendency for these residents to supplement their traditional wage and salary income with additional income from entrepreneurial or other self-employment endeavors. Lastly and surprisingly, the analysis shows a relatively strong increase in probability for residents in the newer buildings to be head of household filers. This is possibly due to the city’s affordable housing efforts to place low-income households in these new buildings via inclusionary zoning and various housing subsidy programs. Conventional wisdom assumes that these newer buildings are attracting primarily high-income residents; however, we find that compared to older buildings, the city’s newest and pricier apartment buildings built during the recent residential construction surge (2013 and after) tend to attract a higher percentage of new residents to the city, and also attract a higher percentage of single, young residents with income below the city average. It appears that both the city’s demographics and apartment rental market are continuing to evolve and change in significant ways. And, it is very likely these changes will have considerable implications on the residential and economic patterns of the city in the years to come. Using data from CoStar, we identified 88 Class A and Class B large and mid-sized apartment buildings (containing 21,203 total residential units) from across the city that were built after 2000. The list can be found here. This study also uses 2015 individual income tax data for all DC tax filers who listed their home address as being in one of the 88 apartment buildings mentioned above. The official start of the Great Recession was December 2007; but the District’s employment continued to grow until September 2008. The years that followed included several shocks to DC’s economy, most notably the effects of the recession and federal cutbacks (shutdown and sequester). Since then, our demographics and workforce changed as we chronicled in many places in this blog. Here are 12 notable economic trends that have shaped the District the September 2008 employment peak to January 2015 (or as close to the January 2015 date as data permit). More people, more households: population grew by 81,200 (14 percent), households by 29,000 (11 percent). 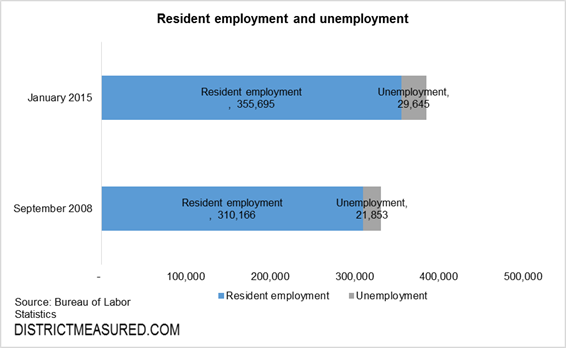 More employed residents working in D.C. or elsewhere. Resident employment, including self-employed and residents who work in the suburbs—increased at a pace twice that of wage and salary jobs located in DC (15 percent v. 7 percent). We added 50,300 wage and salaried jobs and 45,500 resident employees. More of the earnings stay in the city. 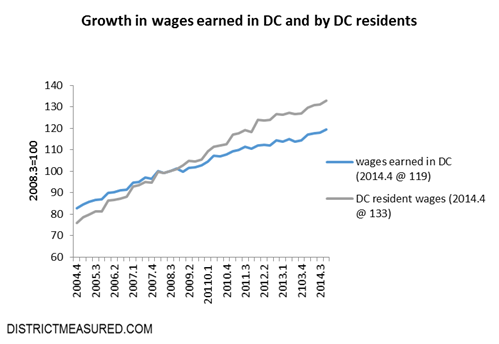 Total wages and salaries received by DC resident grew faster than wages earned in DC. (33% v 19%)—not surprising, given the strong growth in resident employment. Residents seem to be getting higher paid jobs, including ones formerly held by suburbanites who have retired or moved on. Personal Income of all D.C. residents combined grew 25 percent. Adjusted for inflation, this is a 14 percent growth. 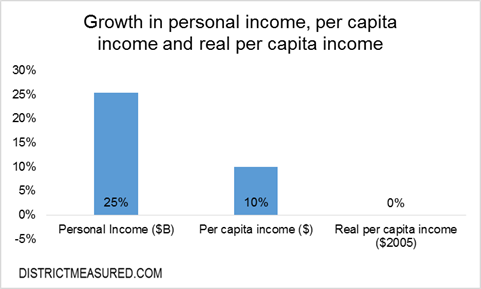 Incomes of households, again adjusted for inflation, grew 2.3 percent, and per capita real income did not grow at all. 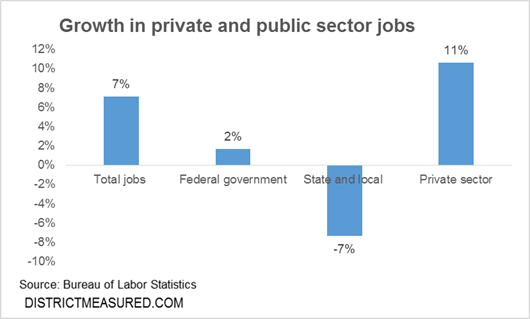 Almost all job growth was in the private sector. Federal civilian employment first grew with the stimulus, and then declined, netting additional 3,300 jobs for the period. The decline in state and local jobs (3,067) offset almost all of the federal gain. Employment became more diversified. The federal government and professional services together accounted for 42 percent of all jobs in September 2008. 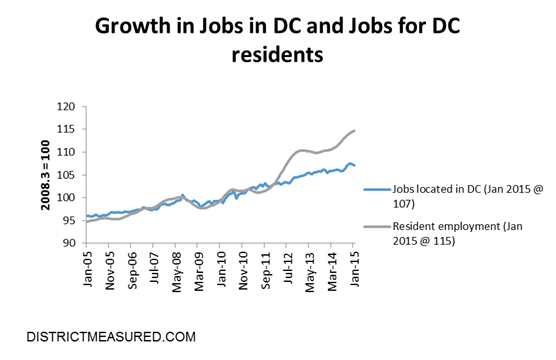 Both sectors continued to add jobs, but this amounted to only 18 percent of DC’s net job growth. By contrast, the four fastest growing industries—retail, education, health, and hospitality—accounted for 73 percent of the growth. The fastest growing sectors are not the highest paying. 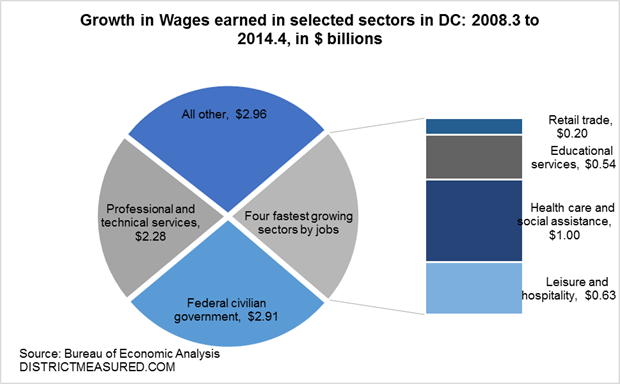 Wages and salaries in the four fast growing industries noted above accounted for only 23 percent of all DC wage growth. Despite their 18 percent share of DC’s job growth, federal government, and professional services accounted for almost half of the increase in wage and salary earnings. This is not too far from their 54 percent share of the 2008.3 total. Housing prices increased faster than incomes. 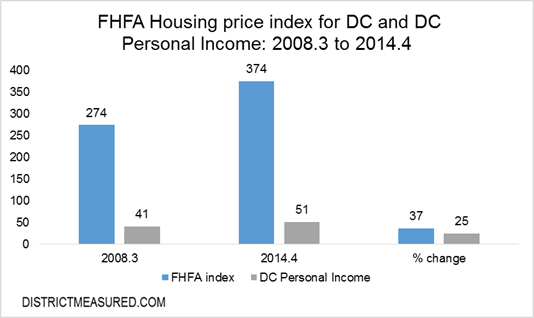 The increase in value of single-family housing units in DC as measured by the Federal Housing Finance Agency outpaced the increase in DC Personal Income (37 percent v. 25 percent ). 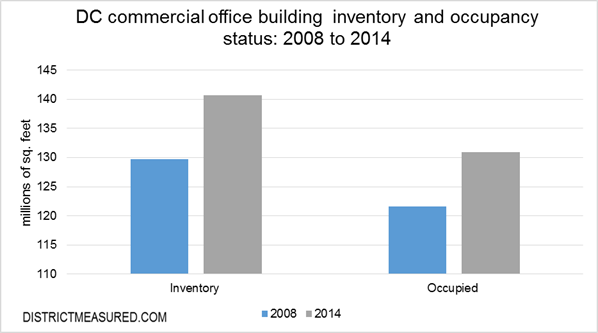 Occupied commercial office space increases matched the increases in jobs in DC (8 percent v 7 percent). Vacancy rate went up a little (6.2 percent to 6.9 percent) as the total inventory rose by 8 percent. DC government tax collections grew at rates similar to personal income. Tax collections, measured by the 12-month moving total went up by 22 percent while personal income went up by 25 percent. The increase in collections reflect policy changes as well as changes to the economy. You can find more on these trends in the District’s monthly Trend Reports. What exactly is this data? Population data are from Moody’s Analytics. Quarterly data, seasonally adjusted. 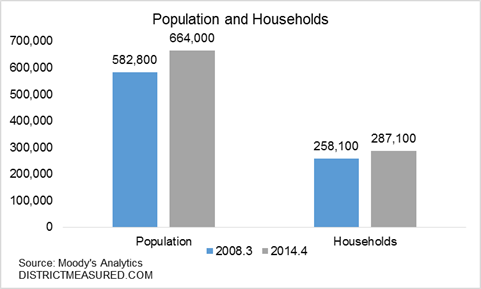 Moody’s derives quarterly population estimates from annual Census Bureau population; it also provides estimates of the number of households. Labor market data are from Bureau of Labor Statistics, Seasonally adjusted. September is the average for the quarter. All measures of employment include full time and part time. Resident employment includes persons working outside of DC and self-employed or contract workers. Personal income data are from US Bureau of Economic Analysis and ORA. 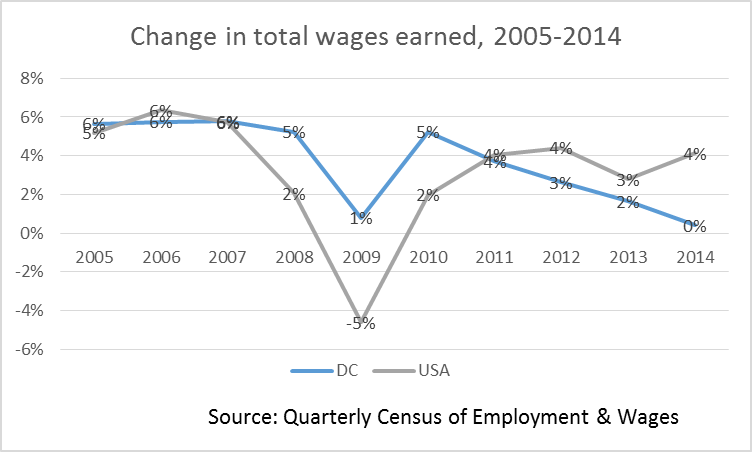 ORA estimates wages of DC residents based on the assumption that benefits as a percent of wages are the same for wages earned by DC residents as for wages earned by all persons working in DC. Property income is rent, dividends and interest and does not include capital gains. Should we all just pack up and move to (insert city here)? 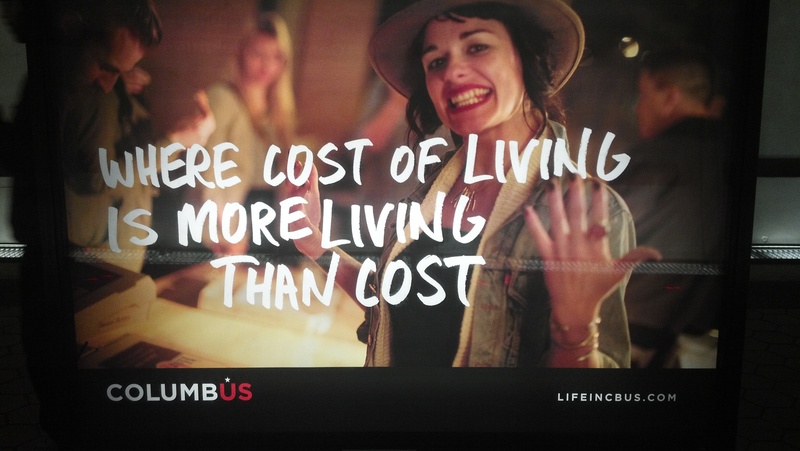 Last week we critiqued a Columbus, Ohio marketing campaign that attempts to lure area residents away by promoting the city’s low cost of living. We found that living in Columbus isn’t going to save a typical millennial as much as you might expect. This left us wondering how the cost of living in the District compares to other jurisdictions. In order to compare, we used the same methodology that we used last week. What we found is that District millennials, even after paying for expensive housing, end up with more purchasing power. Millennials living in Baltimore, Charlotte, and New York City have similar purchasing power to those living in the District. Median monthly rent for a one bedroom apartment in Baltimore and Charlotte is roughly half of what residents pay in the District – however salaries in these jurisdictions are considerably less. Conversely, New York City millennials pay some of the highest rent in the country but large salaries offset the Big Apple’s exorbitant housing prices. Unfortunately for millennials living in Boston and San Francisco, there isn’t much disposable income remaining after paying rent each month. Boston’s high housing costs and low median salary drastically reduce the amount of money millennials have to spend on non-housing goods. As for San Francisco, residents are burdened with the highest rent in the country. The median salary in the Bay Area is also high, but not high enough to offset the city’s expensive rental market. Millennials living in these housing markets might want to consider getting a roommate to help with rent. As we stated in our post last week, millennials that want to buy a house or have children in the District will experience a larger hit to their wallets than if they lived in a comparable city. The median cost of a three-bedroom, two-bathroom home in D.C. is $788,000. In Charlotte it’s $255,569 and in Baltimore it’s $447,021. Child-care for two children in the District is 39 percent more expensive than in Baltimore and 62 percent more expensive than in Charlotte. Despite the large housing and child-care cost differences in these two cities, District millennials can take solace in knowing that the median cost of a three-bedroom, two-bathroom home in Manhattan is $1,355,865 and that child-care costs are 15 percent higher than in the District. What exactly is this data? “Millennial” means people between the ages of 18 and 34. We got the median millennial earnings from the Census Bureau and the rent data from zumper.com. To compare non-housing expenses in D.C. and Columbus, we used the family budget calculator from the Economic Policy Institute. We subtracted childcare costs from the family budgets to get a more realistic budget for millennials living in cities. Data on median home prices is from NerdWallet. Child care costs are from the Economic Policy Institute. Ginger Moored contributed to this article. Stephen Fuller has been telling us for a while that the labor markets in the District and the metropolitan area have not fully recovered from the great recession. Is our labor market changing? The data from the labor department (collected with the help of our own Department of Employment Services), say yes. Total wage growth in the District has fallen behind the nation. Total wages earned in the District (residents and nonresidents combined) held steady between 2013 and 2014, whereas total wages earned across the nation increased by 4 percent. The main cause of this change appears to be the decline in average wages. The District has the highest average weekly wage among all states–our workers on average earn $1,569 a week compared to the national average of $940–but the the growth in average wages has been sluggish since 2011. 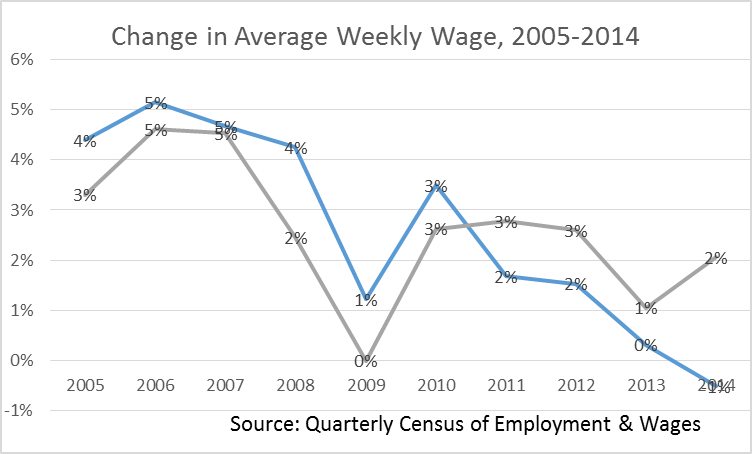 Preliminary estimates show that the average weekly wages declined between the second quarter of 2013 and second quarter of 2014. The average weekly wage is declining because a larger share of the people who work in the District have shifted to the private sector where wages are lower. In 2014, the number of employees hired by the federal government was only 2 percent above the level ten years ago—the levels are 192,650 back in 2004 versus 197,000 today. In contrast, the private sector employs nearly 70,000 more people today compared to ten years ago, when private employment was around 429,000. Those who shift to the private sector, on average, earn $500 less per week. In the second quarter of 2014, average weekly wages paid by the federal government was $1,938 and that in the private sector was $1,432. 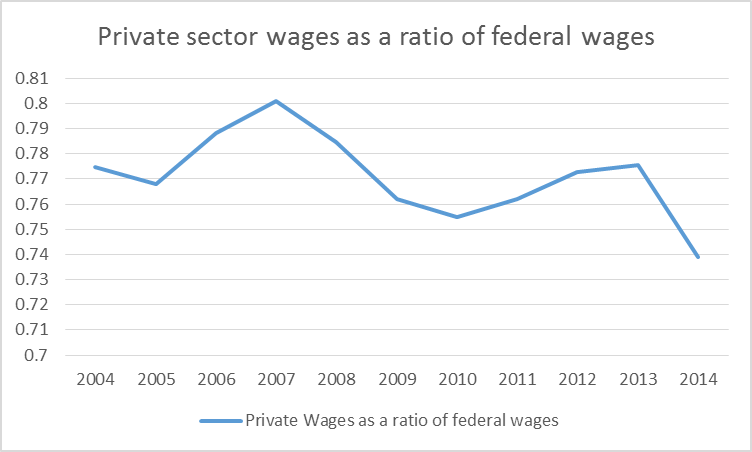 In fact since 2004, the private wages have grown slower than federal wages, and now stand at about 73 percent of federal level compared to 77 percent in 2004. We are often asked about the structure of the labor market and earnings of those who work in the District. The best data source for this is BLS’s State Occupational Employment and Wage Estimates, which we recently used when the Council of the District of Columbia was discussing increasing the minimum wage. 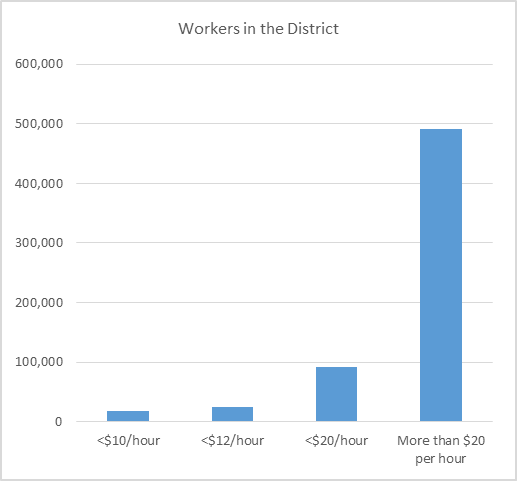 Of the approximately 626,000 workers in the District in the May of 2013, close to 80 percent make $20 per hour or much more. These are people in the sectors typically thought of as professional and business services; they are, lawyers, economists, architects, engineers, computer scientist or specialists, or are in business, finance or management occupations. Which workers earn $20 per hour or less? They are mostly in the service sector, working in food preparation or service, in retail, personal care, transportation, grounds maintenance, or healthcare support. 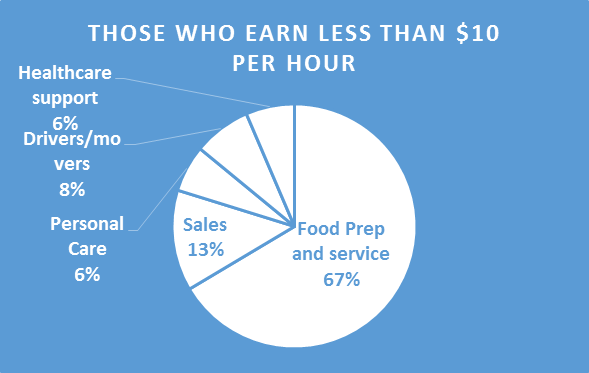 For example, a quarter of the 48,000 employed in food services in the District earn less than $10 per hour and three quarters earn less than $20. These workers constitute 67 percent of those who earn less than $10 per hour in the District. The second largest group among these low-earners is those in sales-related businesses—approximately 2,500 of the 25,000 workers in sales related jobs earn less than $10 per hour. In addition, occupations such as social workers, grounds maintenance, construction, security, and administrative support generally command more than $10 per hour, but a substantive share of the workers in these areas earn $20 or less. For example, 90 percent of workers in grounds and building maintenance positions earn less than $20, and a quarter of construction, security and administrative workers have similar salaries.